If you’re looking to make an entrance in your winter coat this season — and price is no object — look no further than the Moncler "Genius" project. The luxe Italian outerwear brand, which offers styles often ranging from $1,000 to $2,000 and upwards, debuted an 8-part capsule collection in February during Milan Fashion Week. The designer offerings that recently launched within the Italian house’s project have attracted a lot of attention from shoppers. 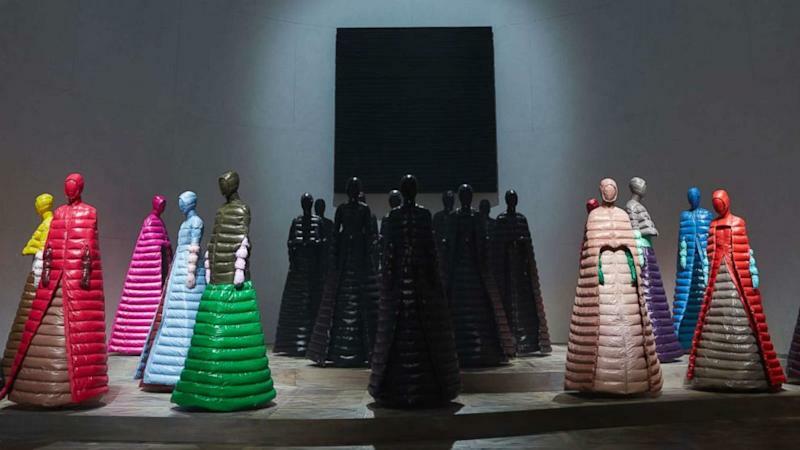 The 1 Moncler Pierpaolo Piccioli collection is among the most interesting. Designed by acclaimed Valentino creative director Pierpaolo Piccioli, these puffer coats could easily be categorized as art rather than functional outerwear. The nylon floor length jackets retail from $3,173 to $3,686. The dress versions will set you back a cool $2,412. They are part of one of the two collections with Piccioli that Moncler debuted in October. "The graphic shapes are as mystic as they are futuristic," Moncler President and CEO Remo Ruffini told the U.K. Telegraph. "He stripped the classic duvet to the bare essence. The result is outstanding." "I tried to give the jackets the essence of couture without using opulent materials, just by choosing shapes and colors," Piccioli told the newspaper. "I wanted to keep pure shapes, without embroideries, using only one material. I wanted to give a different picture to the world of Moncler." “Fantastic Beasts: The Crimes of Grindelwald” star Ezra Miller sported a black puffer piece from the collection for the film's Paris premiere. The 26-year-old actor, who is known for his love of eccentric fashions, completed his look with black gloves, a hood and dark lipstick. Piccioli collaborated with artist Suzanne Jongmans for the "Medieval Madonnas" artwork. These Piccioli pieces fall into the Italian house’s "Genius" project. The Italian label has done away with releasing seasonal collaborations in favor of a fresh strategy of releasing monthly collections with a variety of noteworthy labels. "Moncler Genius project represents a new creative and business evolution for the company: different collections launched on a monthly basis and presented with a 360 editorial plan to create an ongoing program of contents to reach a wide audience with no filters," Ruffini said in a statement to "Good Morning America." "Consumers nowadays require more and more a direct and above all continuous relationship with the brand." "More than ever we want to talk to everyone, everywhere and of every age," Ruffini added. "Stranger Things" star Millie Bobbie Brown supported the new concept when she attended the Moncler "Genius" presentation for the unveiling in February. 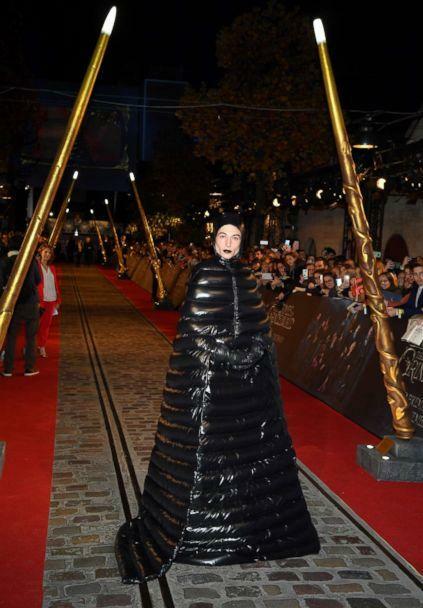 She wore a black puffer dress from Moncler 4 Simone Rocha ready-to-wear collection, another label in the 8-piece project. The actress also starred in an ad campaign for the luxe label, which featured, "nineteen individuals from all walks of life and of every age, ethnicity and origin, united under one claim: BEYOND," according to the brand. The Craig Green collaboration received a massive social media response. The designer said he was given creative control in creating his collection. "He was, like, just do the most extreme version, don’t clutter it," Green told Vogue about his direction from Ruffini. " Make it very direct. To work with someone who encourages weirdness -— that’s been amazing." The project has been a great success for the label, according to Ruffini. He shares he is proud of the energy the project has given to both customers and employees of the company. "I'm very happy with the results achieved by all the Moncler Genius collections," he said in a statement. "The Moncler Genius launches have boosted traffic in our stores attracting new types of customers of different ages, while strengthening our relationship with existing clients." The label recently released the Moncler Grenoble collection and will release the second drop of Hiroshi Fujiwara's "Fragment" label in December.